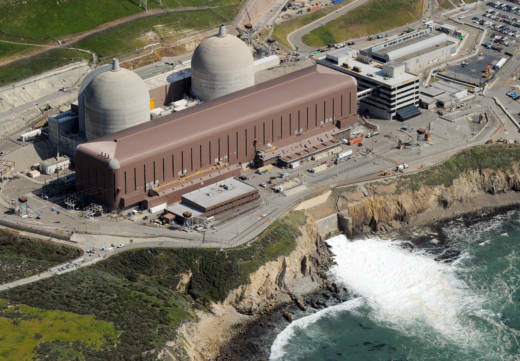 A progressive business think tank in Santa Barbara is asking the state Supreme Court to take up a case it hopes will lead to a new review of the safety of PG&E's Diablo Canyon power plant, the state's last nuclear generating facility. Attorneys for the World Business Academy argue in a petition filed with the high court on Monday that continued operation of Diablo Canyon poses a host of environmental risks, including the potential for a catastrophic failure due to the condition of the plant's Unit 1 reactor structure. The WBA, a 30-year-old organization that focuses on the role of business in solving climate change and energy security issues, is seeking to force the State Lands Commission to reconsider a 2016 decision to renew a pair of state property leases through 2025. Those leases, which involve land on which parts of Diablo Canyon's cooling systems are built, had been set to expire in 2018 and 2019. In a statement Monday, PG&E defended the commission's decision on the leases and disputed the notion that Diablo Canyon poses health or safety concerns. The 2016 lease extension came after an agreement involving state agencies, PG&E, environmental organizations, labor groups and Central Coast communities under which the utility agreed to end operations at the plant's two reactor units in 2024 and 2025. The World Business Academy and other Diablo Canyon opponents, invoking the California Environmental Quality Act, had sought to get the lands commission to require at least a preliminary environmental study of the potential impacts involved in the plant's continued operation. Instead, the agency adopted a staff report declaring that Diablo Canyon qualified for an exemption from CEQA environmental review because it was an existing facility that would continue to operate the same way it had for decades. The World Business Academy sued the lands commission in August 2016, contending that the CEQA exemption and lease renewals were improper. The WBA argued that Diablo Canyon presents a range of "unusual circumstances" that pose a reasonable chance of environmental effects and should have precluded the exemption. Those unusual circumstances, the academy's attorneys argued, include the known seismic hazards at the site; risks to human health; the damage to the marine environment caused by the plant's use of 2.5 billion gallons of seawater every day to cool the plant's twin reactors; PG&E's past safety issues, including poor pipeline maintenance and inspections that led to the 2010 San Bruno disaster; and dangers posed by "embrittlement" of the Unit 1 reactor pressure vessel -- the huge welded-steel structure that contains the unit's radioactive core and fuel rods. A Los Angeles County Superior Court judge ruled against the WBA in July 2017. A state Court of Appeal panel rejected the group's arguments in June, leading to Monday's petition. While that filing revisits most of the earlier issues the business group raised, it focuses most of its attention on the embrittlement issue. Reactor pressure vessels become embrittled and more susceptible to fracture over time as their walls are bombarded by neutrons from the reactor core. A fractured reactor pressure vessel could lead to an uncontrolled release of radiation over a wide area. Diablo Canyon's Unit 1 reactor, built in the late 1960s and in commercial service since 1985, has been cited in Nuclear Regulatory Commission documents as having one of the most embrittled reactors in the United States. The WBA and other groups that have expressed concern about the nuclear plant say embrittlement combined with the danger of an earthquake at Diablo Canyon -- studies have suggested the potential of a 7.5-magnitude earthquake at the site -- heighten the potential for a catastrophe. The new WBA petition alleges that PG&E "is ignoring the problem of embrittlement" and has failed to conduct an industry-standard test that could help shed light on the condition of the reactor pressure vessel. That test involves withdrawing a sample of metal -- variously known as a "capsule" or "coupon" -- placed in reactor vessels when they begin operation. The samples can be removed at predetermined intervals for testing that helps determine the rate at which the reactor vessel is becoming embrittled. In the case of Diablo Canyon, the WBA petition says, no coupons from Unit 1 have been tested since 2003. Based on those tests, the NRC estimated that Unit 1 could run until 2033 before its reactor pressure vessel would be subject to an unacceptable risk of fracture. PG&E says a later analysis using revised federal guidelines found the vessel could continue to run safely through 2044. Arnie Gundersen, a Vermont-based engineer and veteran of the nuclear power industry who has testified on behalf of groups seeking the early shutdown, says he questions the reliability of the NRC estimates. "There's two problems with the 2033 number for embrittlement," Gundersen said in an interview Monday. "The first one is that it's based on a sample that's 15 years old and computer simulations (of embrittlement) after that. The second thing is they've changed the operating procedures, and the operators have to do things exactly right when they shut down that reactor," Gundersen said. "If the plant were to have an earthquake and the operators in their rush to shut the plant down do it wrong, they can crack that vessel, and it would be worse" than the tsunami-triggered nuclear disaster at Japan's Fukushima Daiichi power plant. Gundersen says he advocates withdrawing one of the metal coupons from Unit 1 for testing. "If they become embrittled, that's a good sign that the (reactor pressure vessel) wall is in trouble," Gundersen said. "But if those coupons come out and they're not embrittled, that's a perfect sign that the wall of the reactor is ready to go to 2024" -- the scheduled date for Unit 1's retirement. Blair Jones, a PG&E spokesman at Diablo Canyon, said in a statement Monday that the plant's Unit 1 and Unit 2 reactor pressure vessels "are safe and highly reliable, and are designed against embrittlement." Jones said that the utility conducted a "full, volumetric, ultrasonic inspection" of the Unit 1 vessel in 2016. Such ultrasound inspections, required every 10 years under NRC regulations, focus on the integrity of welds in reactor pressure vessels. Jones said the inspection found "no signs" the Unit 1 vessel was becoming embrittled. San Francisco attorney Kirk Boyd, part of the legal team representing the World Business Alliance, said in an interview Friday his client is not seeking the early shutdown of Diablo Canyon. "The goal is to have them do the inspection to figure out just how dangerous the situation is," he said.